As promised, here's my review of Free Range Learning, written by Laura Grace Weldon. Free Range Learning is a refreshing, up to date collection of homeschooling ideas, stories and suggestions based on the philosophy of natural learning. In this book, Grace Weldon essentially encourages parents to trust that their children are wanting to learn and to facilitate this wherever possible. Sections of the book deal with topics such as social learning, slowing down, homeschooling within the wider community, mentors, homeschooling and technology and the life change that homeschooling inevitably brings to your family. I found this book to be accessible and full of information about individual subject areas and how to make them engaging to children. It was easy to pick up and read during the day because of its informality, easy language and attractive style (A4 with plenty of gorgeous pictures). It inspires me to view homeschooling as a larger philosophy of everyday mindfulness and to interact with my children in a natural way, picking up on their individual areas of interest and investing some energy into facilitating their passions as well as introducing them to new topics where appropriate. Personally, I loved the input by homeschooling parents throughout the book, and Grace Weldon has generously shared their stories. I was pleasantly reminded that as homeschoolers we are connected by shared experiences all over the world. The joys and struggles that accompany homeschooling are universal and we can learn from the experience and wisdom of those on the same journey . 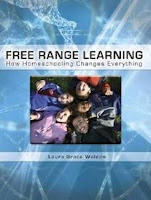 Free Range Learning by Laura Grace Weldon (2010) is published by Hohm Press.